If you’re a Ducks’ fan or an NFL team in the market for a physical defensive back with great ball skills, then Ifo Ekpre-Olomu is a guy you want to keep your eye on this season. Simply put, he is a ball hawk who has the aggressiveness to legitimately project as a boundary corner in the NFL. Ekpre-Olomu can play man, press, off man, zone, or blitz the edge using his speed and closing burst. As a one-year starter for the Ducks, he’s still raw but he’s got the athleticism, footwork and instincts that it takes to be an early first day pick in the upcoming NFL Draft, if he decides to declare. While I won’t go as far as to say he’s a legitimate shutdown corner prospect at the moment, I feel he can develop into that type of player over time. According to NFLDraftScout.com, in his first year as a starter at Oregon, Ekpre-Olomu compiled a Pac-12 leading 20 pass break ups in 2012 (1.53 per game), which also ranked 6th in the nation, 4 interceptions, 63 tackles (44 solo, 19 assisted) and was tied for the league lead in forced fumbles with six! Wow, that’s some production for a first-year starter! Ekpre-Olomu’s height (5’10”, 190 lbs) is something that could be a concern to some NFL scouts at the next level, but when I watch his tape, I see a gifted athlete who plays much bigger than his height. I think many fans and coaches want to see bigger defensive backs these days because of the size mis-matches around the league at WR and TE. But defensive backs with more size typically sacrifice speed or quickness and there aren’t many examples of good NFL defensive backs that are taller than 6’1″. Keep in mind Joe Haden, who isn’t even 6′, is an elite shutdown CB. The bottom line is that depending on arm length, instincts, quickness, hands and the ability to read the play, a CB can make up for a few inches in height. I believe Ekpre-Olomu has plenty of room for growth in terms of adding strength and weight to his frame at the next level, but his instincts and quickness are excellent. 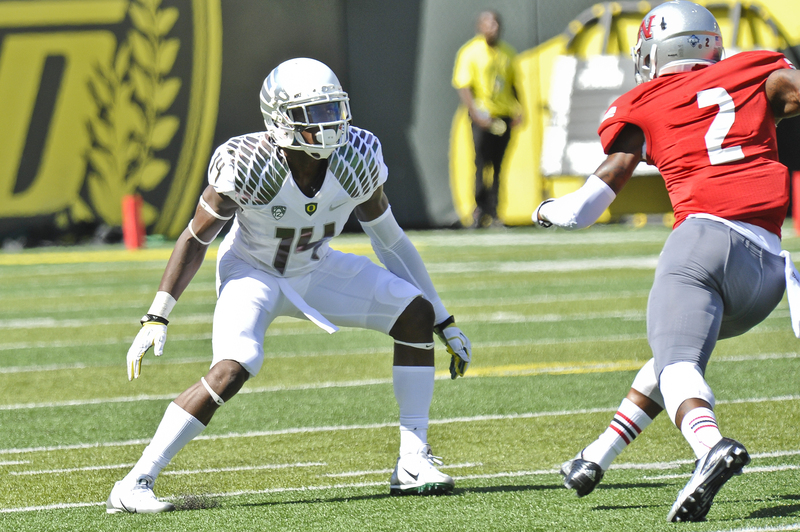 Ifo looks to join defensive backs Pat Chung and Jairus Byrd in the NFL. Ekpre-Olomu has smooth, quick, balanced footwork and back pedaling, which allows him to cover significant ground in a short amount of time. He is able to quickly switch directions and flips his hips smoothly, while keeping in stride with the receiver laterally and vertically. He works best while in man-to-man coverage, pressing up on the line, jamming the receiver and causing him to alter the timing of his route. While I think his hand usage at the LOS is a strength, I think he needs to continue to get better at this. The video available represents a small sample size of his game play, but I saw a lot of hand usage downfield outside of 5 yards, which in turn drew lots of pass interference penalties. I am not sure if this was more a function of him being beaten and not able to catch up to the route in some cases, or him just being overly aggressive and trying to make a play. Regardless, I will be watching to see if he can avoid the pass interference calls this season. It’s hard evaluating a CB without watching film, because you can’t track the WR’s route or the defensive backs position throughout the entire play. But there are clearly aspects of the play and the game that jump off the screen when watching defensive backs on normal HD film. One of these characteristics is instincts, and as I mentioned before, Olomu is very gifted in this area. He reads the QB and the play well and then uses his speed, which allows him to jump routes and get his hands to the ball. He has what I consider to be very good game speed, closing in on tackles quickly and can be found flying around the Duck secondary making plays on the ball in coverage. What I particularly like about his instincts, is that he is able to get his head around and locate the ball while running with the receiver and has the body control to position himself where he can deflect the ball. For a sophomore and a first-time starter last year, this was a very encouraging sign. The part of his game I’d like to see him improve is in his ability to get both hands on the ball and convert touches to interceptions more often. Ekpre-Olomu can deliver a big hit and seems to enjoy “lining up” a player like a safety often can, but his technique isn’t perfect and sometimes his effort in tackling isn’t consistent, especially in smaller spaces where he can’t line up a player from a distance. In these instances, he sometimes struggles to fight through blocking and could be found arm tackling or diving at players’ feet in hopes of tripping them up. While I see him often setting the edge and flushing the runner inside toward help, I’d like to see him fight through blocks with more effort and create space where he can break down and initiate contact, instead of waiting for it to come to him. Overall, I think Ekpre-Olomu will fit best in a system that allows him to play to his strengths, as a press-man or off-man defensive back. He is a defender who can use his aggressiveness and ability to locate the football and disrupt passes down field, while using the sideline to his advantage. He’ll need to prove he can play with bigger, stronger receivers at the next level, but barring anything unforeseen, I believe Ekpre-Olomu has the speed, ball skills, physicality and aggressive nature that are going to help him become one of the first defensive backs off the board next spring. If he is determined to be a need, I could see Ekpre-Olomu being a great fit for the Browns, should he be there when Cleveland picks in the first round. 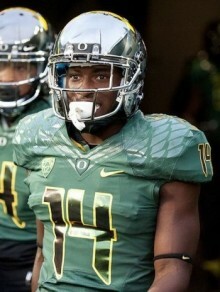 Ifo really likes to hit hard! He pursues the play with a high motor, against the running game. He seems to play with a consistent, tough effort and uses his hands a lot in press coverage at the LOS to re-route his WR or disrupt the timing of the route. This is part of what he’s asked to do. However, he uses his hands often downfield – and outside the allowable 5-yard boundary — and this gets him in trouble with PI (pass interference) more than I’d like. He seems to possess elite closing speed. At the 1:44-ish mark in 4th quarter, and although the unfortunate outcome on the play was a catch, and a great one by No. 15 Nelson Agholor — Ekpre-Olomu showed the ability to read the play, locate the ball in coverage and leap to deflect pass at its high point. KRUPKA’S FILM ROOM: Ekpre-Olomu turns and locates the ball in the end zone, goes over his shoulder and disrupts the pass perfectly from Marqise Lee! The play: First and goal, man, press coverage. Ekpre-Olomu is playing the boundary on the weak side. You can see the push-off strength in real time play, as he creates just a little bit of space and causes the WR to go off his timing and slightly off his balance. 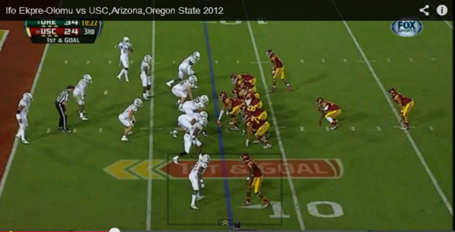 Here you can see Ekpre-Olomu with his eyes on the QB as the ball has just been released by QB. 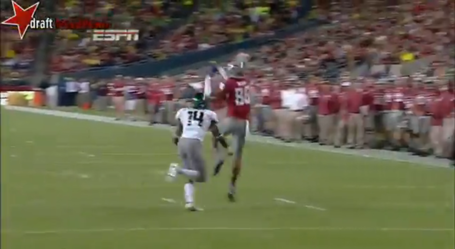 Notice Ifo is still engaged with the receiver. Literally, in a split second, Ekpre-Olomu has completely flipped his hips and turned his body around 180 degrees, while keeping his eye on the ball and getting his hands up in the air to attack the ball. This is the point on many plays, watching the available film, that you think the receiver is going to come down with the catch, but in real time (and a little more clearly below ), you can see that Ekpre-Olomu actually reaches his hand in over the top of the receiver’s hands and knocks the ball out just before Lee can secure it for the TD. Ifo breaks a Trojan heart! He seems to be playing the man and not looking for ball on the first pass into the end zone, but he does well to react to the player by going up and touching ball, and then shoves him to disrupt the catch. He sets the edge versus the run in the red zone, and is able to push the WR off to create space so he can line up to make the tackle and keep the edge. This allows both he and his teammates to combine for the tackle on the play inside the 5-yard line. His Pick within zone coverage? Ekpre-Olomu reads the play, as the QB throws to the backside looking for the curl, but the WR continues up sideline signaling for the higher throw into the end zone. 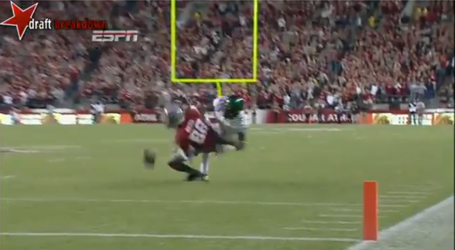 Olomu is in perfect position and makes the grab along the sideline, and in-bounds! He has very strong and active hands. He seems to be able to locate the ball when in traffic, while battling with the WR. 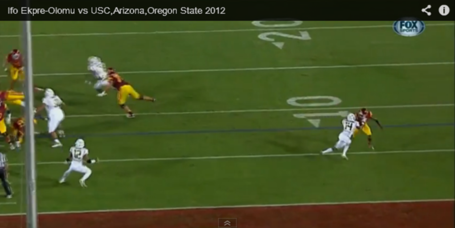 He doesn’t deflect the pass initially, but he locates and strips the ball, as the WR is bringing it down. He demonstrates his very aggressive hands! His PI call is just outside the end zone, as he uses his hands to go around the WR from directly behind him, thus doesn’t get around the side door. On next play, inside the 2-yard line, 3rd-and-goal, Ekpre-Olomu is playing the boundary corner, pressed up on the short side of the field and on the weak side of the formation. He jams the WR at the snap and continues to engage the WR using hands and arms within the 5-yard area — rule applies even though it’s in the end zone – and forces the receiver into a slow cut. 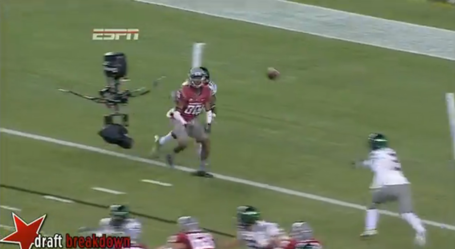 This disrupts the route’s timing, allowing Ifo to dive to deflect the pass. He makes an amazing pass break up but ran into and grabbed the WR along the sideline. The trip drew a flag. BUT, had he not made the play, then the flags are picked up because it would have resulted in a TD. The WR clearly had the position, height, and the advantage of seeing the play. 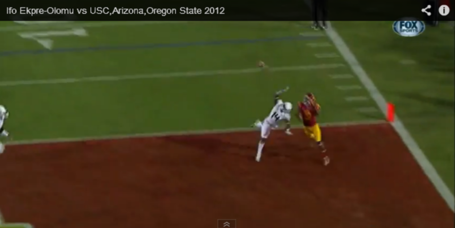 Ekpre-Olomu was facing WR whole time, didn’t see the ball until it was in WR’s hands. 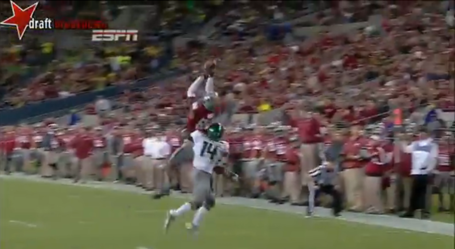 It was a great job by Ifo to go up and make sure the wide-out didn’t catch it. Text book coverage! He’s a Ball Hawk! Ifo finds the ball early, making extraordinary plays look routine! 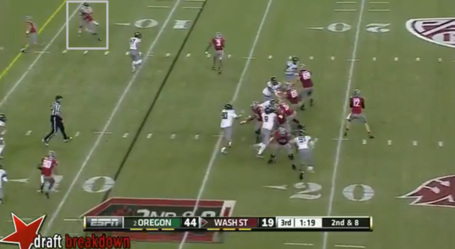 He has an effective edge-blitz on a read option, and Olomu goes for RB. 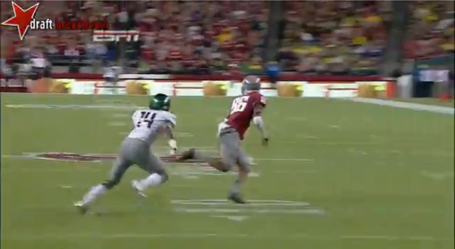 Carr keeps it, and Ekpre-Olomu nearly recovers enough to get to the QB, who gets the ball off just as Ifo closed in. He’s a Ball Hawk AGAIN! We see a pick-6 where he shows speed and explosion. He shows up again in run support in first half as at 11:49 on the YouTube film – at 2:12 in the 2nd quarter, he does a great job setting the edge and battling through blocks on the outside. E-O shows strength using hands and jab against the WR in the slot. Good mirror in coverage, with smooth feet, and quick. He uses hands downfield from time to time, thus a correctable habit. He missed a big play down toward the end zone that was not his fault, as the coverage was blown, over the top, by the safety. He does a good job reading the QB, playing more of a field-corner role in off-man or zone coverage, but is able to jump the route and make a great pick in front of the WR along sideline. Ifo is active early with his hands, breaking up a deep pass along the sideline, while showing some good boundary corner ability and length. He plays strong press coverage in several situations in the Red Zone, against a tall, 6’3″ WR in Marquess Wilson. KRUPKA’S FILM ROOM: At the last minute, Ekpre-Olomu breaks up another pass with some sneaky-strong hands. The play: It’s hard to tell without coaches film, but Ekpre-Olomu is playing what appears to be off-man, giving the WR some cushion. Ifo stalking . . . 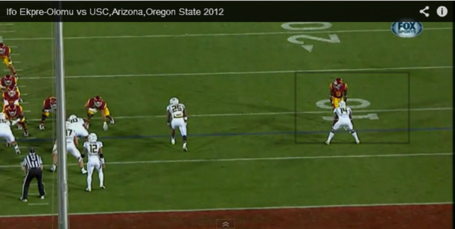 Here you can see Ekpre-Olomu breaking on the route, (above) recognizing that the ball is about to be delivered. Apologies for the blurriness of some of these snapshots, but I think the point I am trying to illustrate will be clear. Here he has closed some of the gap between the receiver, but the QB notices the space or cushion being given up to one of his tallest receivers and delivers the ball up high, whether on purpose of not. 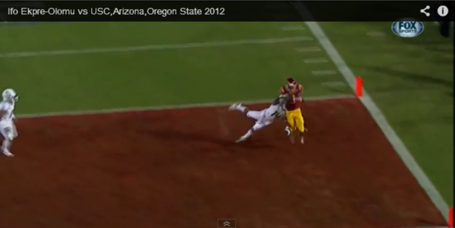 This seemingly puts Ekpre-Olomu in a bad position to make a play. Ekpre-Olomu keeps his eyes on the ball even though he’s out of position. He’s aware and focused on his only opportunity to make a play at this point. He wraps the receiver up here, and his next move is to shift his weight and slam Wilson to the turf. While he’s not close to the ball, notice his hands are up and around, in the receivers chest, not down around the waist. The same area receivers pull the ball down into when completing a catch. As he wraps and tackles, he is able to spin both his weight and the receiver around and once again, just when you think the WR has the catch, Ekpre-Olomu is able to sneak his hand around and knock the ball loose well before the receiver hits the ground. Excellent play! He plays press coverage, man, zone and off-man, as well. He is very versatile in that regard. He has excellent run recognition, a strong edge-contain angle, and a big hit/tackle in the red zone with: 50 seconds left in 1st quarter . You can see his closing speed and tenacity here. On the very next play, 2nd-and-goal from the 4-yard line – with: 24 seconds left in 1st quarter – Ekpre-Olomu is once again covering the taller Wilson on the weak side, in man coverage. He has great recognition to stay with the play and locate the deflected ball thrown in the middle of the field. He continued his coverage even though the play didn’t go his way, and he then locates the ball, making the heads-up INT in the end zone! KRUPKA’S FILM ROOM: Ekpre-Olomu makes another great pass deflection in the end zone! 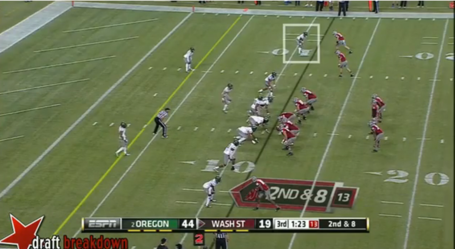 Here he is again, against the 6’3″ Wilson in the Red Zone, with tight press coverage, and man coverage. He has good positioning. As you can see, Ekpre-Olomu is planting and pushing off nearly at the same time as the receiver, and showing a good, quick reaction in a tight space. Ball is on the way! Here he appears to be lost behind the receiver, with the ball on the way, and although you can barely see his head, he is breaking on the ball and knows it’s coming. Here you can see that he uses the arm with best position possible to reach up and make the deflection on the ball in the end zone, saving what could have been an easy TD catch against a less-aggressive defensive back. 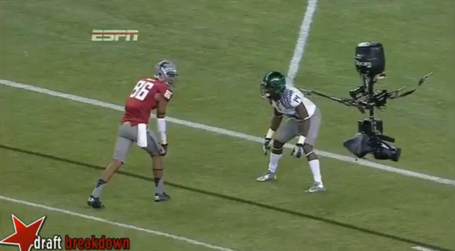 Ifo had great downfield coverage, even with an excellent throw along sideline. He slips while trying to launch himself toward the ball, but he gets his head around, avoids contact before catch and is in perfect position to make the play! 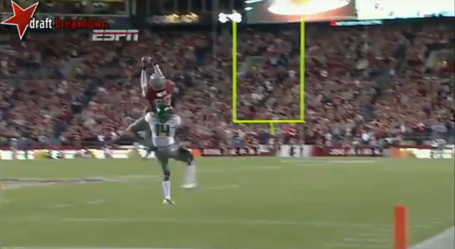 At 6:20 in 2nd, Ekpre-Olomu gets beat in over-the-top zone coverage for a TD. It looks like he tried to cover inside, but the play attacked the pylon. KRUPKA’S FILM ROOM: Fast forward to the 3rd quarter, wtih 1:23 left on the game film / 5:18 mark on the YouTube video. It is an amazing read and pass defelction against what appears to be a TE, in man coverage, and again in the end zone! Press coverage with little wiggle room. Here he is at the top of your screen, actually playing on the strong side in man/single coverage with only one safety over the top. Here you can see the man coverage, as Ekpre-Olomu is blanketing his receiver, meanwhile the safety has allowed the slot man to run vertical, and will soon be breaking on a out route / curl of some sort. 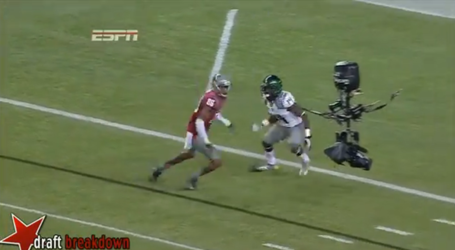 Ekpre-Olomu’s man is about to cut back inside, leaving Ifo out of position, since the safety will be evacuating to the outside with the slot receiver. Ekpre-Olomu is able to come across underneath, jumping the route and using his quick burst of speed to get himself in position to break up this pass beautifully. The only thing I want you to see here, is his ability to go up and catch this ball versus just knocking it down. As our LBs mature, look for the Duck D to be the difference against upper-tier teams such as Stanford and UCLA. *Want some College Football humor? Check out FishDuck.com‘s FIRST GIF! (Click here) Pass it along!